The application is based on the scientific research. 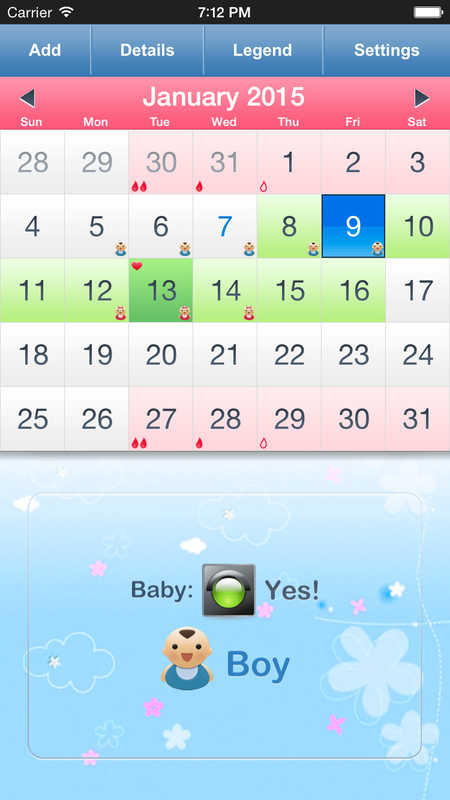 It helps to determine the fertile days of the month, so you can either achieve or avoid pregnancy. 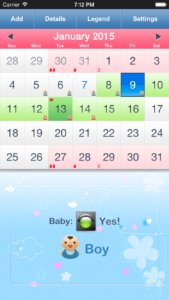 The application uses the date of the last period and shows the date of the next period, the best days to conceive a baby, the ovulation day and when you can avoid pregnancy. 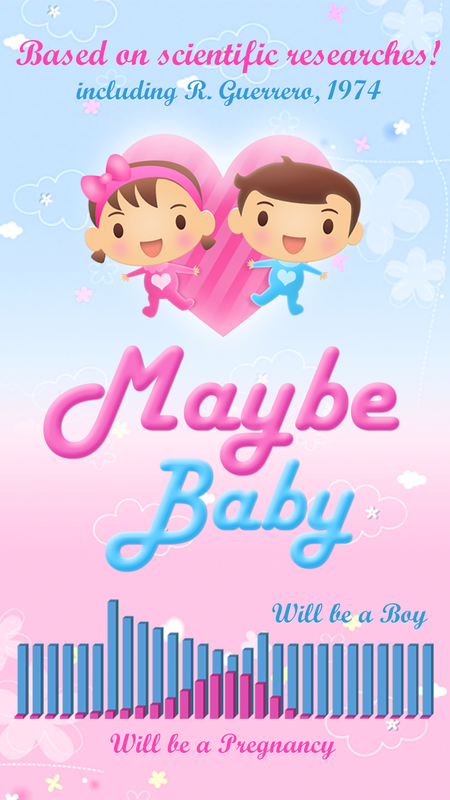 The popular baby gender prediction method is used by default. But it’s based only on the widely-spread theory by Landrum Shettles. 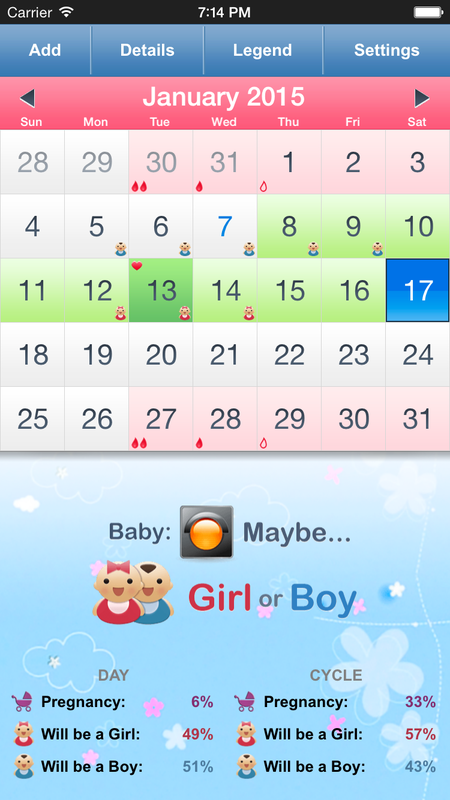 The application also supports the scientific baby gender prediction method. It’s based on the scientific research by Rodrigo Guerrero and the statistics of thousands of women. You can change the gender prediction method on the “Settings” screen. 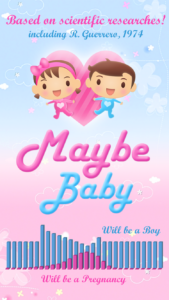 But remember that either gender prediction method shows only slightly higher chances of conceiving a girl or a boy and it never guarantees the result. 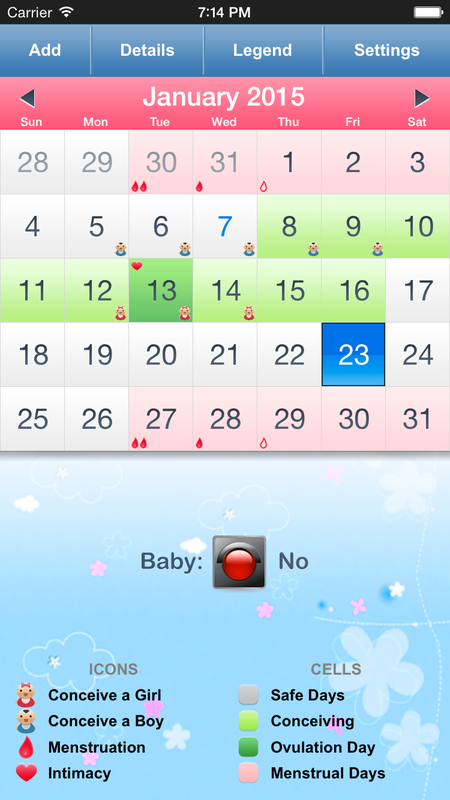 The probability of getting pregnant on the current or on any selected day. The probability of conceiving a girl or a boy using the selected gender prediction method. 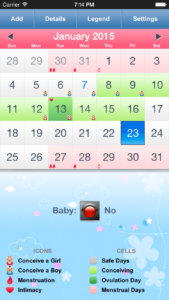 Chances of getting pregnant during the current period. 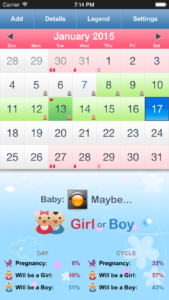 Chances of conceiving a girl or a boy during the current period. The first day of the last cycle (select the day and use the button “Add”). Average length of the menstrual cycle (adjust it on the “Settings” screen). Length of the luteal phase (most women can use the default value). 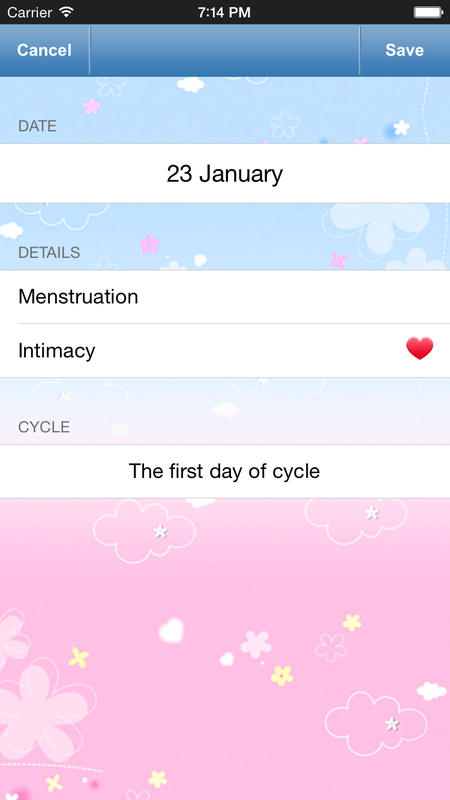 The application works best for women with regular menstrual cycle. But average cycle length is also a good way to predict when the ovulation should happen. Supported languages: Afrikaans, Amharic, Arabic, Armenian, Azerbaijani, Bangla, Basque, Belarusian, Bulgarian, Burmese, Catalan, Chinese Simplified, Chinese Traditional, Croatian, Czech, Danish, Dutch, English, Estonian, Filipino, Finnish, French, Galician, Georgian, German, Greek, Hebrew, Hindi, Hungarian, Icelandic, Indonesian, Italian, Japanese, Kannada, Kazakh, Khmer, Korean, Kyrgyz, Latvian, Lithuanian, Macedonian, Malay, Malayalam, Marathi, Mongolian, Nepali, Norwegian, Persian, Polish, Portuguese, Punjabi, Romanian, Russian, Serbian, Sinhala, Slovak, Slovenian, Spanish, Swahili, Swedish, Tamil, Telugu, Thai, Turkish, Ukrainian, Vietnamese, Zulu. Supported devices: iPhone, iPad, iPod and Apple Watch. You can also look at other menstrual calendars: Menstrual Calendars.